Search Results for "walking desert"
An aggressive Tyrannosaurus rex lets out a fierce roar. 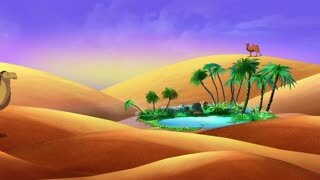 Cartoon animation of a camel train travels across a desert in the sunset with space for your text or logo. nice color grades of Sand dunes and pyramides full hd and 4k. Caravan Camel Train WalkCamel train on a clean background. Isolated caravan from a camel with different goods. Animation contains an alpha channel.